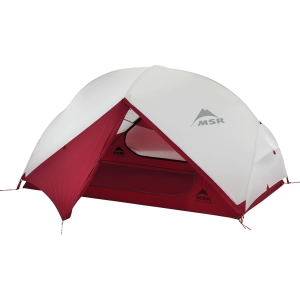 A two-person tent best suited for those that value livability a little more than shaving ounces. 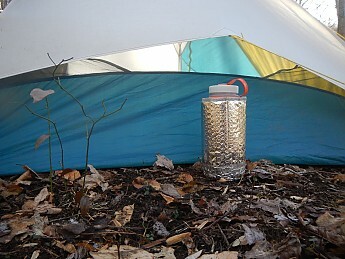 Sierra Designs touts it as good for car camping or backpacking and I agree; this really is that rare 'tweener design. 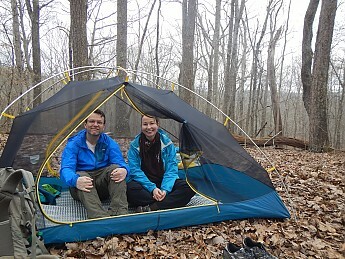 This is a great couples tent for those milder weather trips. 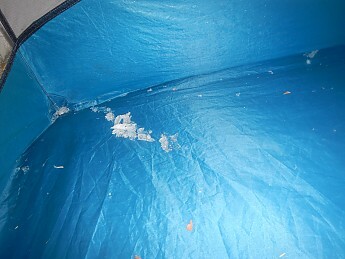 Though marketed as a three-season tent, I would avoid using it  during  the edges of shoulder seasons or winter for reasons listed below. 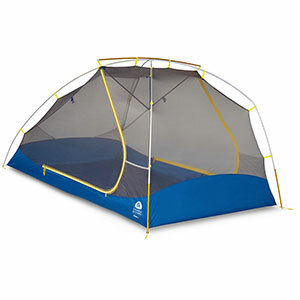 Upon the first use of this tent my wife and I had the same thought at about the same time: this tent reminded us of the old parachute games we'd play in school as children where all the  kids would hold the edges of the parachute and bounce a ball or whatever. So from then we referred to this as "the parachute tent". 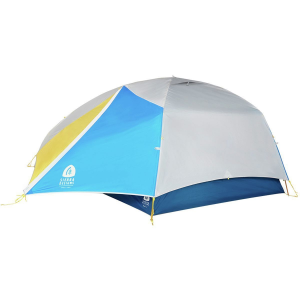 This tent pitched as many freestanding tents do: you stake out the four corners, assemble the poles, and match color codes on the pole ends and fly to complete. I will admit that I had some initial difficulty with my sample; it turned out I was testing a pre-production prototype and there was a manufacturing error with the color codes. Even so, once I realized the error it was very simple (and I would go so far as to say intuitive) to assemble. 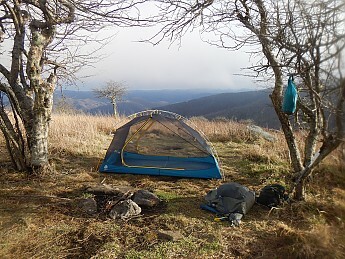 SD says about this tent "so much room you'll want to extend your time in the outdoors" and while this is true for me regardless of shelter, I do agree. I've encountered very few tents marketed for two people that really work for two; this one does. 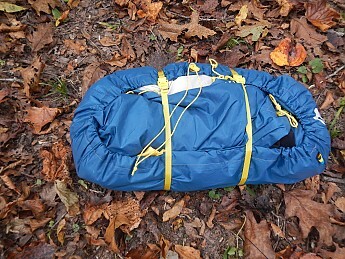 I enjoyed the ample headroom when changing clothes or positions and my wife and I were easily able to fit our packs and gear under the two vestibules. 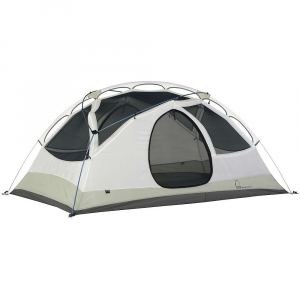 This tent has almost 30 square feet of floor area and a 41-inch peak height which doesn't seem that large on paper (as compared to say a Big Agnes Fly Creek 2 HV with 28 square feet of floor and a 40-inch peak height) but once you camp in it with another person you can appreciate the difference. 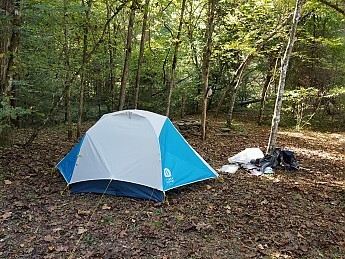 **As pointed out to me by fellow Trailspace Review Corps member Jake W, claiming a tent to be a comfortable size for two is highly subjective and he's absolutely correct. Taller and larger people should note the listed specifications. 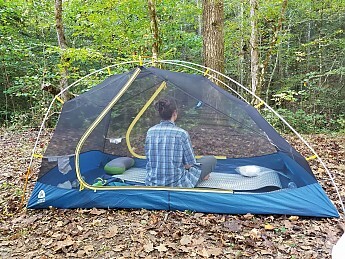 We also truly enjoyed the fly design: you can roll the fly back or forwards and up both sides, etc... on warm nights with little breeze this was a treat to star gaze or just to feel more connected to the surroundings. 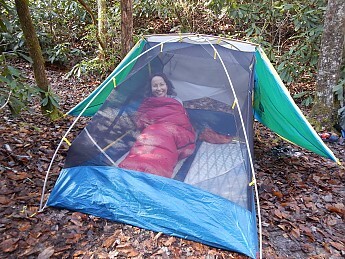 In these example photos below my 5 foot 7 inch tall (1.7 meters) wife is modeling the interior space. The fly and body are 68D PU coated Poly Taffeta and I like having a floor beefy enough to not worry about using a footprint. 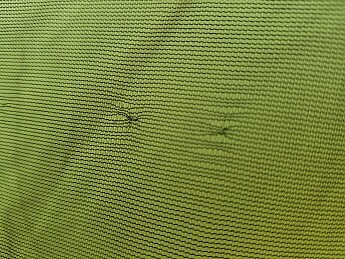 However, the 15D mesh on the tent has developed over a dozen small scrunched spots so far. I don't think the holes are large enough to allow insects in but there are a lot of them and they keep developing. So far it just seems like a cosmetic  issue but still makes me frown when I notice them. 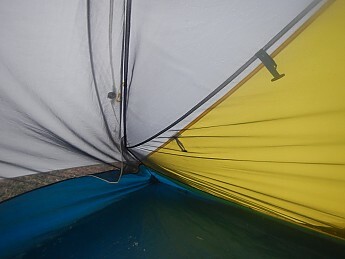 The DAC poles seem adequately durable but the design of the tent makes for some long pole legs which as noted below tend to deform readily in wind or snow. 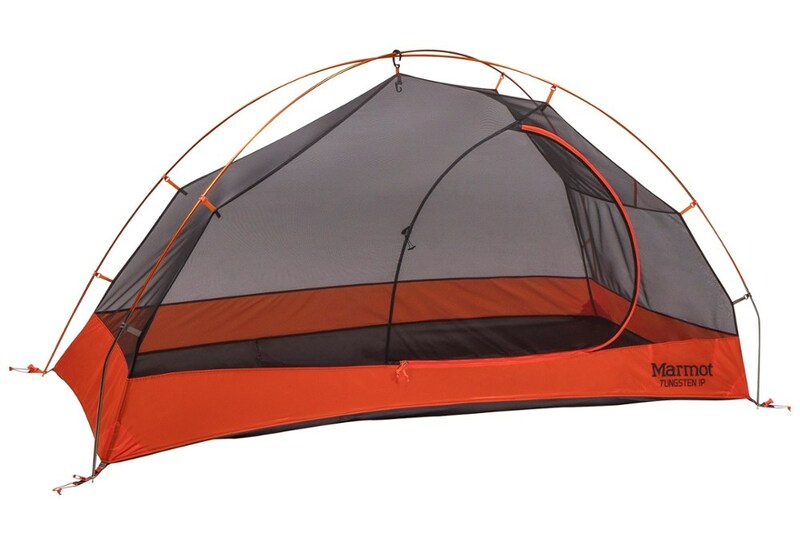 When I first saw this tent pitched my immediate concern was the height of the fly with this somewhat hybrid design (single / double wall). 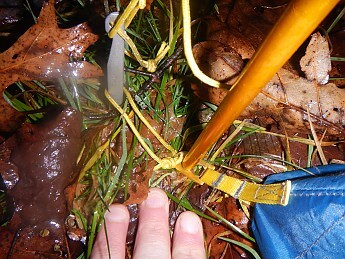 I was worried that it might allow blow-through in horizontal rain as the fly only comes to within a few inches of the ground at the lowest point and over 12 inches off the ground at the head and foot. But that high cut fly sure lets the air flow well. 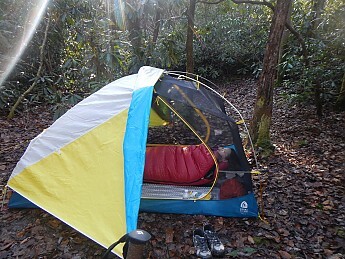 Upon her first entry my wife said “whoever designed this tent wants you to breathe!”. 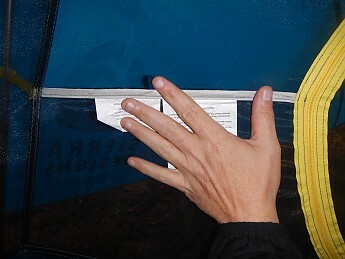 This is a very well ventilated tent. 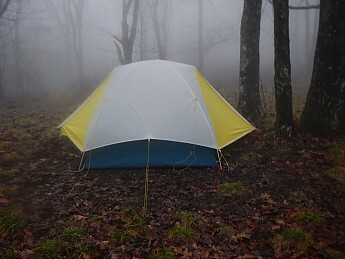 My first rain experience was in the Lewis Fork Wilderness of Virginia; I had eight solid hours of vertical rain (no wind to speak of) and all was well; no leaks or issues whatsoever. 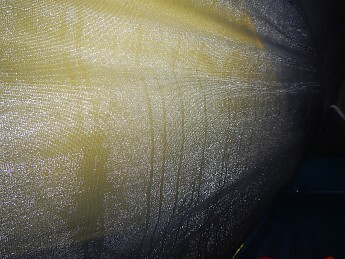 This photo shows the moisture collecting on the mesh body inside the fly. 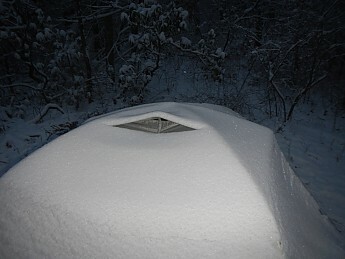 The wind was blowing from that side; the other side of the mesh body didn't collect nearly as much moisture. 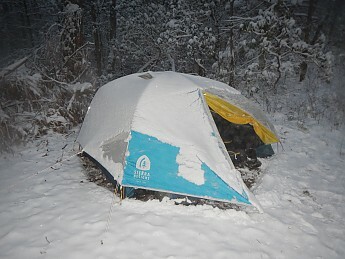 In cold weather I also observed fog and moisture collecting on the mesh inner then freezing into ice and eventually falling into the tent. It wasn't enough to matter much but somehow some of that fallen ice got under my gear and melted giving me a bit of water on the floor. 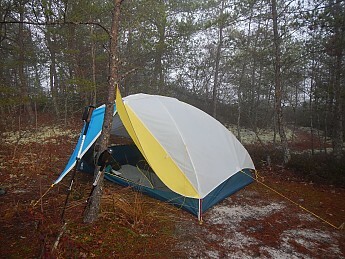 This is a relatively  tall tent (41 inch /104.1cm peak height) and as such it didn't fare well in strong winds during my testing. 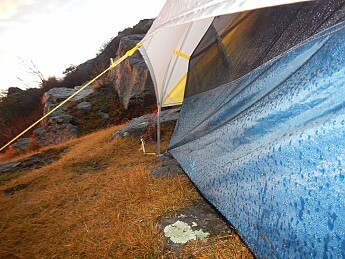 I experienced a lot of wind penetrating the shelter and noted that the walls deformed easily. 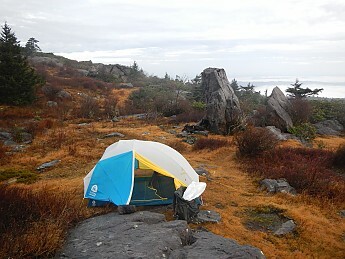 I wouldn't recommend a high exposed camp in this design but with a little forethought in site selection it does well enough. I highly recommend using all the guy lines as well as the Velcro fasteners on the inside of the fly. 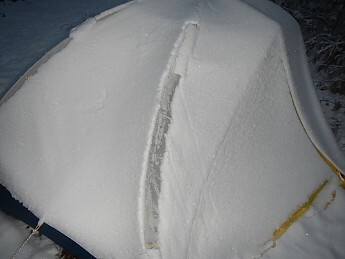 Being a three-season tent I didn't expect it to be great at snow loading and it wasn't. 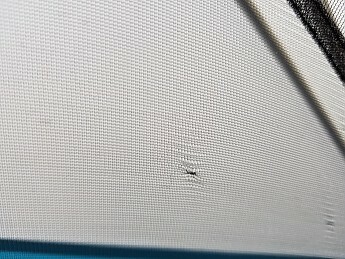 About an inch of wet snow was enough to make the long poles sway out of position and allowed the fly to press against the inner mesh. Again, this is not the tool for that job, it’s just that my testing period coincided with winter weather. 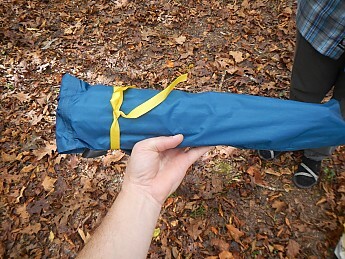 The Meteor 2 comes with a neato Burrito Bag stuff sack as well as a bag for the stakes and poles. 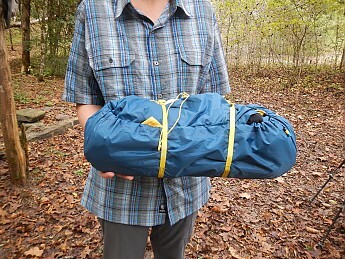 For much of the testing I didn’t use the Burrito Bag as I prefer to let the tent fill up some blank space in my pack and not have a hard-packed object to work around. 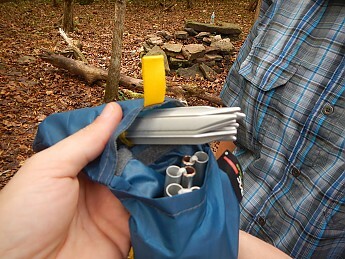 The Burrito Bag worked as advertised though and was intuitive to adjust and use. 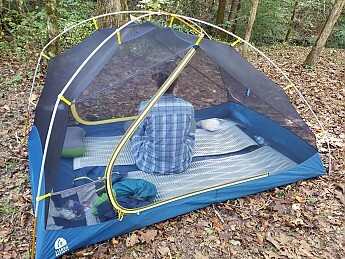 While this isn't a very adaptable tent (limited to 2.5 seasons really), I find that it fits a niche as a very nice couple’s shelter for the type of trips my wife and I embark upon (usually somewhat fair-weather and temperate (50-80 degrees F/10C-26.6C)). We both really enjoyed using it. 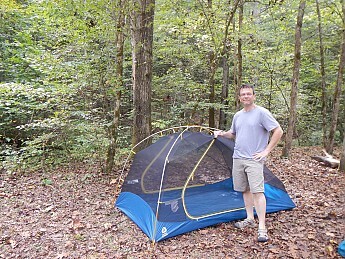 And while my wife and I rarely car camp, the ample space does indeed lend this tent to that function as well. 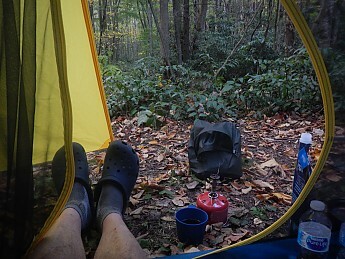 While I did many solo trips with this tent for purposes of the review, it's a bit on the heavy side for me to use extensively as a solo shelter. 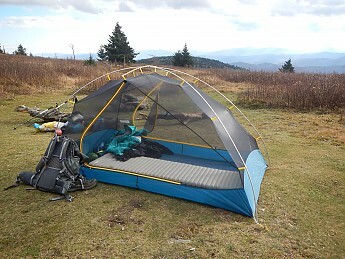 The relatively poor performance in very windy conditions limits its use and as such I can’t tout the value as being a major pro but by today’s standards it is relatively inexpensive. 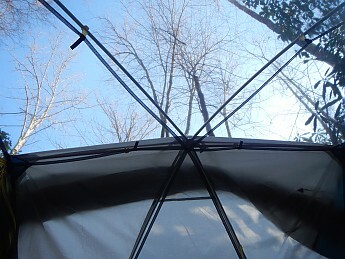 But in the right application this is a nice and enjoyable shelter to use. 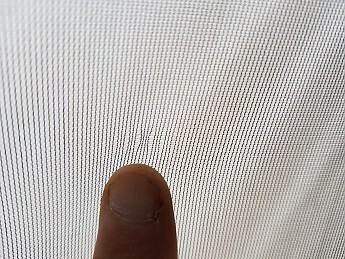 I would find this tent usable over a wider range of applications if the fly were able to be drawn closer to the ground to seal out wind-blown moisture or perhaps if the body had a low band of solid fabric instead of being all mesh. It would also be nice if the mesh was a little sturdier. All those little scrunched spots don’t inspire confidence in durability. 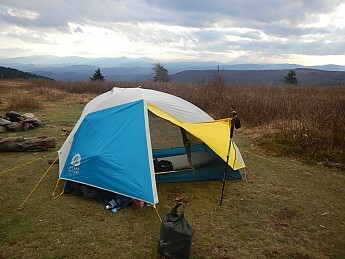 I used this tent for 18 nights of backpacking from October 2017 to January 2018 mostly in the Southern Appalachian Mountains of TN, NC, and VA.
I’m a passionately avid backpacking geek and typically pull between 30 and 40 short trips covering about 1,000 miles annually. I've done more than 7,000 miles of trekking over the last decade. To see where I go check out my Trip Reports here on Trailspace. Looking out the door while enjoying morning coffee. 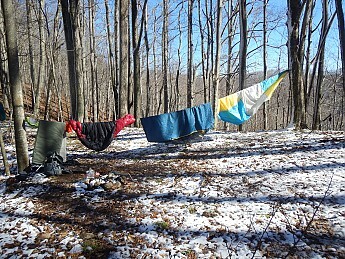 I think I recognize several of those camp sites Patman! Great review...I should have taken some photos of you in the tent in October. 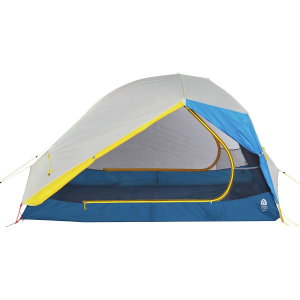 The tent looks like an actual two person tent. 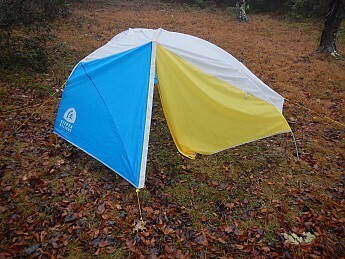 I'm so used to seeing modern 2P tents that barely fit one person. 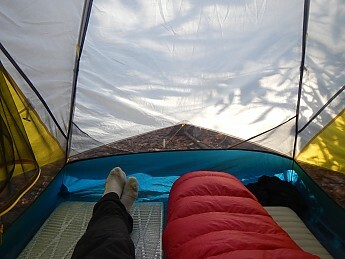 In some of your pics, it was hard for me to concentrate on the tent. Those locations are beautiful. Love the snow pic too. Excellent review, as always, Patman! Great review, info, and pictures, Patman! 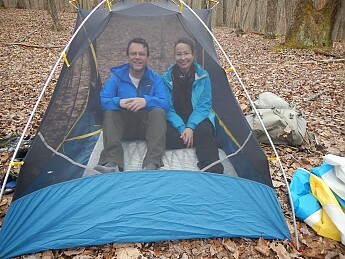 Thanks to you and your wife for testing out this SD tent. Nice work on the review Pat! 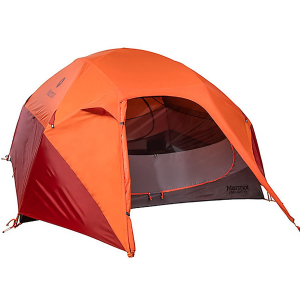 I hate the color combo on that tent, but I love the review. Nice job, Patman.